← Loving infographics aren’t we? 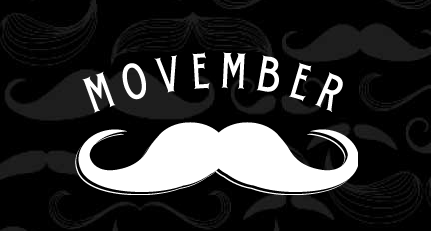 As you know, today is the 1st of November, meaning that Movember’s here. If you have no idea what Movember is, it’s basically a not-for-profit, charitable organisation, focusing on raising awareness in regards to man’s health (prostate and testicular cancer). The idea is that every man and women from all over the world should not shave for the whole month of November, and ask people to sponsor their Movember movement. These people basically donate their face for the event. The thing behind this movement is the way they market themselves as a brand, that implicitly creates a sense of belonging with the people who are involved in it. Men and women that are involved in this movement are called as Mo Bros and Mo Sistas. You might wonder what would Mo Sistas sacrifice? Definitely no moustache grown (perhaps), but more towards women that support this cause. Movember market it as “behind every great man, there’s always a great woman”. As for the month of November that’s sort of translated into Movember, this has somehow changed people’s perception towards this particular month. If they once encountered this Movember trend, they will unlikely forget about it. I guess that’s the benefit of having a brand name that is very catchy and can simply involve anyone in any part of the world. Via online platform of communication, Movember communicate the total of the money raised, from whom and where these people are located. These Mo Bros and Mo Sistas can choose whether they want to raise funds individually or as a team (Movemeber separate between the individuals and teams in their online leader board). In addition. they’ve recently launched their Movember mobile app, enabling the Mo Bros to share their experiences in the movements, hence creating further awareness via social medias. But it doesn’t stop there. They also introduced reward system that give prizes to people that raised certain amount of funds, so they can redeem those reward or get chosen to be the winner of certain contests. Further, involvements can be divided into certain categories according to Movember, and it can either be in the workplace, community, or even industry challenges. These activities are very important for the growth of an organisation, making the brand perceived to be alive and active. Because of the challenges and direct involvement by people (instead of just giving money), Movember has successfully gain support from many people all over the world, as well as more and more awareness gain each period. With what Movember has done, I reckon they’ve performed a very good job in building the sense of belonging around its name and activities. People voluntarily involve in this movement, doing activities such as donating their face, time, money, and effort to this cause. Therefore, the sense of belonging is translated into each individual’s effort to market the movement themselves (smart huh?!). NOW, are you ready to let beards and moustache of your grow?! And ladies, ready to support you man in this journey?